1) Green Oaxaca Animals - The carved and painted wooden animals from Oaxaca are beautiful little pieces of art, but I have always found them too colorful for me. When I was in San Diego this month, though, I thought of how I can incorporate them into my style: collect them all in green only. An armadillo and a lizard are the start of my all-green collection. 2) Tortoiseshell Cameo - Yes, I went to an antique store or two in California, too. I wear my cameos all the time, so why not get another one? This one is brown and black and rectangular, making it different from the ones I already have. 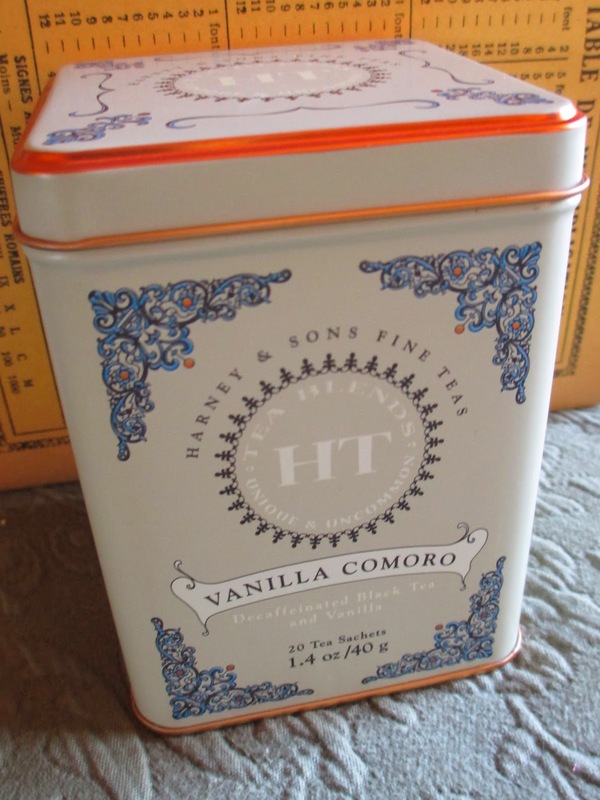 3) Harney & Sons Vanilla Comoro Tea - I've already mentioned how much I loved the Rust General Store. One of the things I bought there was this tea, which comes in such a pretty tin and smells like the most delicate and fragrant vanilla. I've been getting a lot of vanilla teas lately, and I think this one might be my favorite. 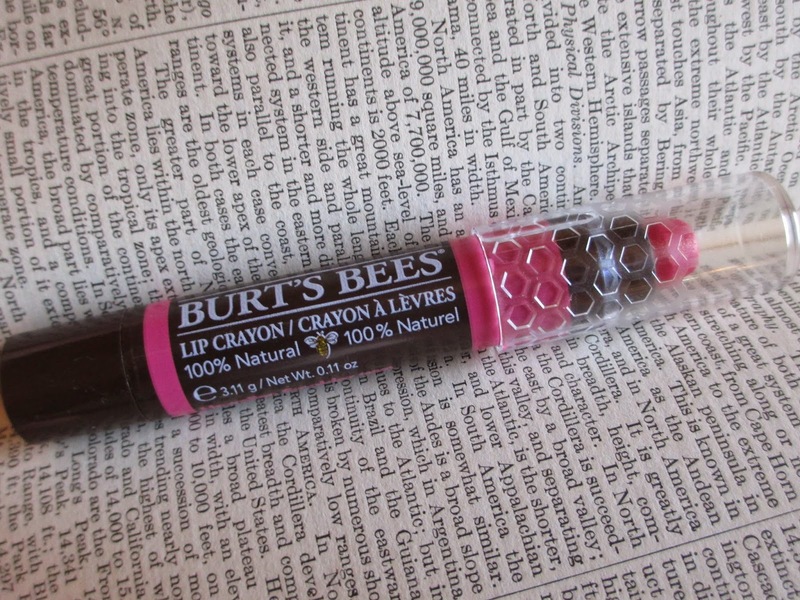 4) Burt's Bees Lip Crayon in Hawaiian Smolder - Good old Burt's Bees. Their tinted lip balms were perfect for when I was in school: they add just a touch of color, which is what you want when other people around you don't tend to be wearing much makeup. Given that those colors ran light, I picked out one of the brighter shades of the lip crayon. This product feels more like a lipstick but still has some moisturizing to it. It stays on pretty well if you apply a lot; if you want a lighter look, you can always add just a brush of color. 5) Chocolate Notebooks - First I saw one and then the other two, and I rebelliously decided that I didn't need to choose just one: I could get them all. In mint green, lavender, and deep brown, they're all gorgeous, whether you use them for recipes, chocolate tasting notes, or whatever else. 6) L'Oreal Nail Polish in Pop the Bubbles - I hadn't used glitter nail polish since I was around ten. But then I was going to the beach and glitter does go with sand and this polish is in a sea serpent shade (sea serpents are cooler than mermaids), so I got it. 7) Pigeon Figure - Some time ago, I found a brown pigeon that instantly took up residence among my books. So when I saw another one in gray at a different store, how could I say no? It was a good thing I didn't: the woman at the register said they stopped making them because the cast iron was becoming too expensive. 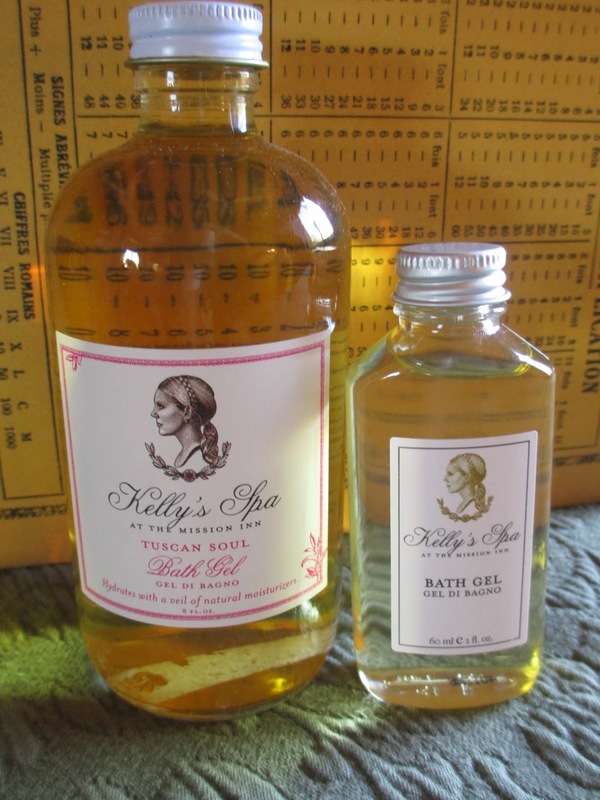 8) Kelly's Spa Bath Gel in Tuscan Soul - If you've ever stayed at the Mission Inn in Riverside, you will be familiar with the spa products that they stock the rooms with. Finally I decided not to be content with a tiny bottle of bath gel and went to the spa store to buy a full-size version. The scent has just become so luxuriously familiar to me. 9) Lavender Tea Tree Oil - I was looking for tea tree oil (it's great for keeping things clean and even keeping away certain bugs, plus it smells fresh like eucalyptus) but all the store had was tea tree with lavender. And you know what? The two smell great together. I'm obsessed now with spraying tea tree lavender. 10) Tarte Gifted Amazonian Clay Mascara - Tarte doesn't have very many mascaras, but it took me a while to try this one. I think I might like it a tiny bit more than the others. Maybe. Plus, it has this beautiful bamboo case. 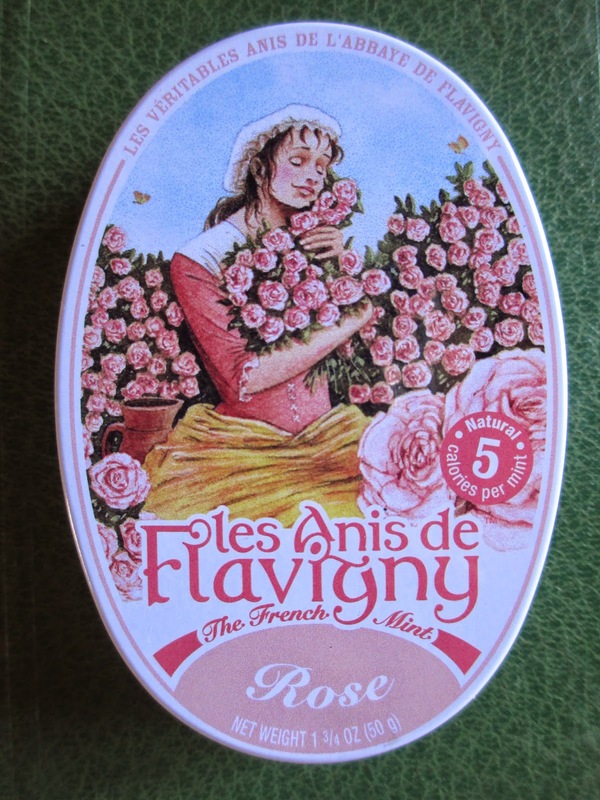 11) Les Anis de Flavigny French Mints in Rose - The Rust General Store also had these lovely mints. My friend likes to buy the violet version, which I'm not too fond of. But I love rose, so I had to try these; they're delightful and the tin looks gorgeous in my purse. I might just have to buy more online when these run out. 12) Yellow Notebooks - Yes, I bought even more notebooks. 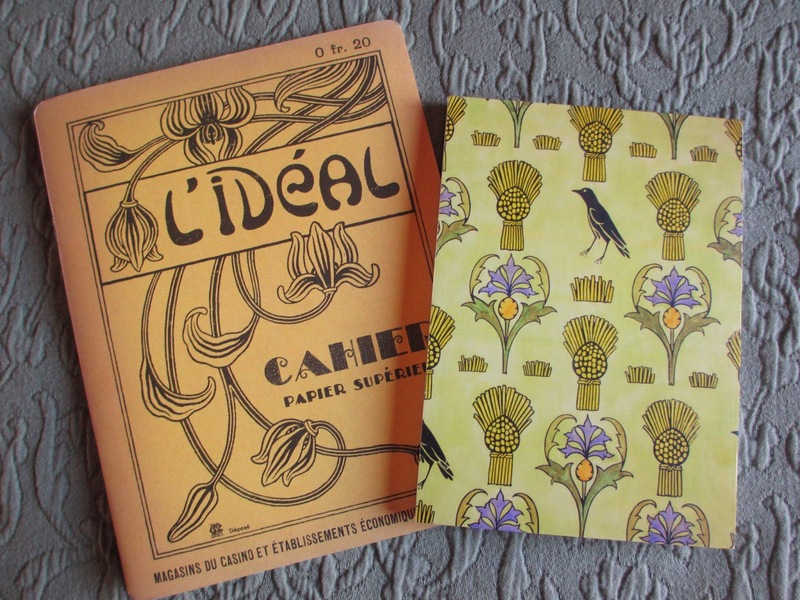 The one on the left is French, and the one on the right uses an old textile pattern. They're both lovely and slightly rustic. If you could choose between a tragedy and a cyclical story, which would you choose? I always found it interesting that, if you watch Star Wars in released order (original trilogy first, then prequel trilogy), it ends with a sad ending (The Revenge of the Sith), the happy ending (The Return of the Jedi) being lost somewhere in the middle of the story. But it turns out that the story is in fact much sadder if you watch in chronological order, even though this allows you, officially, to end on the happy ending. It always seemed like it would be so wrong to watch the prequel trilogy first; I never had done it before. Granted, while growing up we only owned the original trilogy and Episode I. So we would either watch the trilogy or the single episode. When I got to college, I watched Episodes II and III for the first time since they first came out; I would watch the two of them together. Once I ended up with the whole I-VI set, I watched it in released order a couple of times. Then I decided it was time to try something new, to just try it and see what it was like. When you are watching the prequel trilogy after the original, you've just come from seeing the defeat of the Empire. It all feels more like seasons of peace and seasons of chaos. So as you see the start of the Emperor's reign, you're thinking, oh, so this is how it all started. But when the prequel trilogy is the first part that you watch, you don't have the same sense of hope and history: you're watching the reign of terror begin for the first time and its end seems very far away. Everything feels much more tragic. Then once you move on to A New Hope, the perspective is still different. Instead of watching everything fresh from Luke's eyes as he learns about the rebellion and everything else, you are watching with the idea of a broken family in your mind. He is the son who had his family taken from him and is now left to try and put things right. Yes, Luke helps Darth Vader change back to Anakin Skywalker in the end--but all the years they could have had together are lost. The family unit was ripped apart as soon as it began and can never go backwards. The Empire is defeated--but its reign was still at the expense of this family. And the personal can be very tragic. If I lived in San Diego, I would be at the Rust General Store all the time. I couldn't work there because I would steal everything. Food, candy, tea, honey sticks, soap, candy, tea, and did I mention the chocolate? The store opened in 2011, which may have been after my last visit to the area, so this might have been my first time there. I, um, I bought a lot. I was even more excited here than in the candy store. 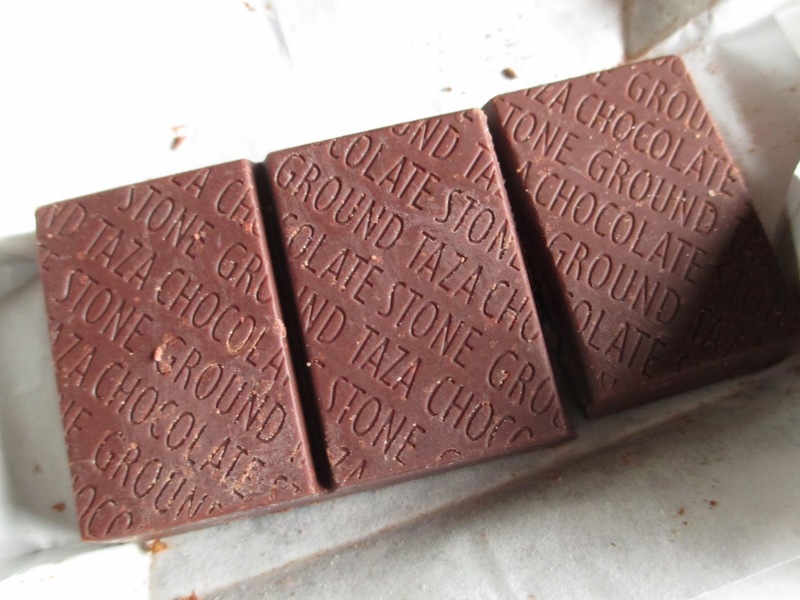 One of the things I bought was this little, 24 gram bar from Taza Chocolate. I've had most of Taza's chocolate bars, so it surprised me to find something I had never seen before. The Hazelnut Crunch is part of the Tazitos Minibars range, which are all 65% cacao chocolate with crisped brown rice and one of five flavors: plain, almond, coconut, peanut, and hazelnut. I like hazelnuts, so that was my choice. The tiny bar is only about three inches (8cm) long, so it's divided into a simple three pieces. The small/medium-sized hazelnut pieces can be seen from the back of the chocolate. 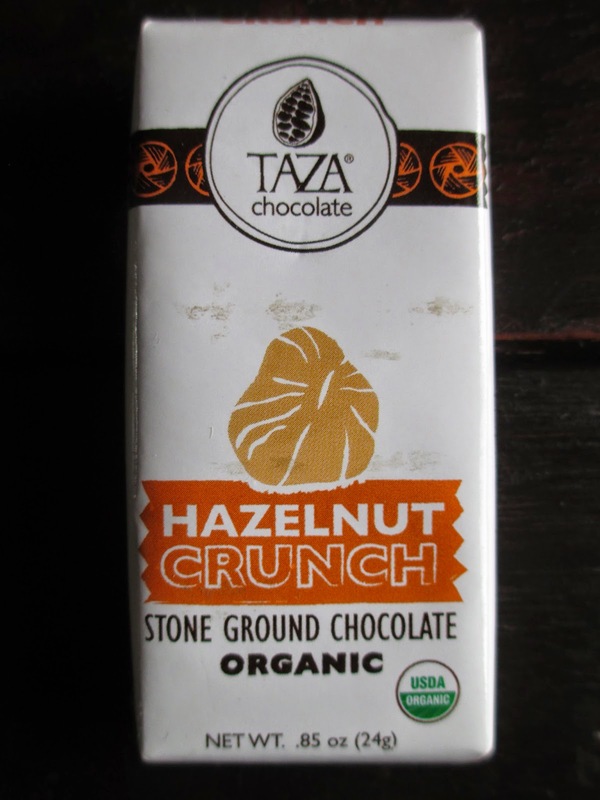 If you are unfamiliar with Taza, you must first realize that this is stone ground chocolate, left in a less refined state than most chocolate you buy. The particles have not been ground down as small, so it has a rustic feel to it while still being very good. It's chocolate you have to munch on, which in fact goes well with the addition of nuts. When you bite into the Hazelnut Crunch, you taste the chocolate and the hazelnut and then wonder what the other flavors are. It's the vanilla and the salt: they're less hidden as they might be in a smoother bar. They've come out to be part of the party with the chocolate and hazelnut. Soon you discover that not all the crunch comes from the hazelnut; some of it is the crisped rice, which is made with sugar and molasses. This bar is absolutely delicious. And yes, it's organic and Direct Trade. The 65% dark chocolate is steady on its feet, the hazelnut is casual, the crisped rice and vanilla are sweet, and the salt adds texture to combine the flavor of the nuts with the rest of the ingredients. I'm not sure how to label it all. 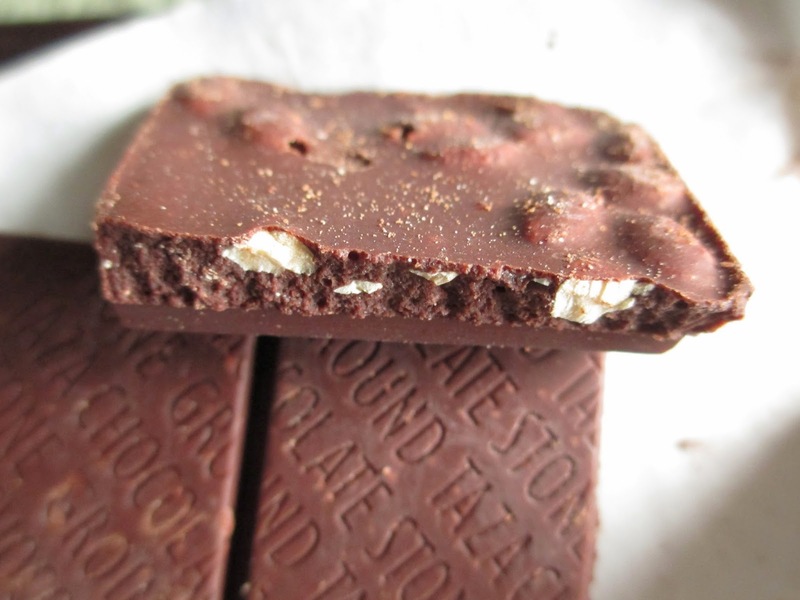 A gourmet candy bar, no: it's too good on its own to call it that. A snacking bar? That sounds too boring. But honestly, the small size and the casual-yet-good-quality nature of this bar make it perfect for hanging out near the register at stores. It's something you can quickly pick up to satisfy all sorts of cravings, whether you're craving chocolate, a bit of sugar, or just something to munch on. I don't think there's anything out there that's quite like this bar; no one could have put it together quite like Taza. I want to finish it all up, but I also hate to see it go. It is a strange thing to stop watching a TV show on Netflix or Hulu and to begin watching it, episode by episode, as it airs on TV. It is very strange to have to wait in between episodes, and somehow everything new that you see feels all the more new than if you're watching a pile of episodes online. It just feels different. Season 8 is my first season of Doctor Who that I will be watching on TV, episode by episode. This is it; this is the beginning. Fitting, then, that this season is also the start of a new doctor's reign. Sure, I watched Christopher Eccleston regenerate into David Tennant and David Tennant regenerate into Matt Smith, but Matt Smith regenerating into Peter Capaldi feels so much more permanent. He isn't the next actor that I'll be watching for the coming week's worth of episodes (as it is when you're watching old episodes online); he's going to be the Doctor for I don't know how many years to come. I don't know if it's heartbreaking this time; it's just weird. Everyone was also expecting this to be a weird transition because we're going from the youngest doctor to a much older actor. But oh, my goodness, the script has all this make so much sense. The Eleventh Doctor was always trying to be young and enjoying being young and pushing away worry. He left the Twelfth Doctor to inherit all of that worry. He carries an enormous burden of time with him. This first episode had such wonderful moments in it, moments that ponder the difference between physical identity and inner identity. What does age mean? What impact does eternity have on individuality? How can you keep one character intact if he is constantly changing? Does he have anything new to give? Anything good? Besides giving this episode a wonderful steampunk style, the clockwork droids serve as a way to combine the episode's plot with what is happening to the Doctor. His questions about his own identity reflect back and forth to the droids. And the connection to "The Girl in the Fireplace" (which was one of the episodes that helped establish the Tenth Doctor as, in many ways, a tragic figure) also helps us reconnect that sense of tragedy to this doctor. Then there's that scene where he tells the dinosaur that he'll save it and it instantly burns up in flame; that was just the entire show (at its current point) encapsulated in a single moment. The Doctor, believing all can be right in the world and that he can help make it so, but bringing death and destruction in his wake. Clara's reaction to Peter Capaldi's doctor is not only a smart way of helping the audience get used to a new doctor, but also an intriguing exploration of character. Who is any person? Would we be the same if our consciousness could be put into a different body? What does "the same" even mean? And are we even "the same" all throughout our lives, even if we live in the same body the whole time? These are the types of things I find so compelling about this show and while the time travel, the history, the action, and all of that are all fun, it's this that keeps me most interested. So as a first episode, "Deep Breath" was quite good and definitely has me curious to see more. When I spend a little time in Cambria while visiting Hearst Castle, I adored the pretty little town and walked out happily with a huckleberry chocolate, finding the flavor very pleasant. Cousin's Candy Shop in San Diego also had a lot of huckleberry products; I bought a small jar of jelly and two truffles, one milk and one dark. In simple foil wrap, they didn't strike me as anything that would have an amazing level of quality--but just as something nice and simple to come across while walking around. The first chocolate I unwrapped was in the lighter shade of purple, so I thought it must be the milk chocolate, even when I saw its light shade of brown. But it turns out that the truffle in the darker wrapper was in fact the one with lighter color. (They were labeled in the store, but I quickly forgot which was which.) The dark chocolate is standardly creamy and the milk chocolate standardly sweet for confections. Nothing fancy here. But I'm still fascinated enough by the huckleberry flavor that I still don't really care if the chocolate is good or not. The purple filling tastes like berries but also like sweetness; it goes well with the creaminess of the chocolate. If you were to use a better quality chocolate, you would also have to have a better filling. But as it is, with both of them being mediocre, these truffles are simply a chocolate berry candy. I was never expecting them to be anything more than candy. Sure, it would be nice if they were, yet I still enjoy finding random chocolate candy at wonderfully fun candy stores. And there's something about huckleberry that tastes like nostalgia . . . maybe because it's a flavor that isn't often used anymore. Let me finish by saying that everything in the top picture is by now long gone, except for the three items on the left (rose mints, a small Taza bar, and chocolate Necco wafers). I guess I did eat half of it on the car ride back home. I do love candy. I've been having a good time this week: in preparation for Season 8 beginning on Saturday, BBC America is playing all sorts of Doctor Who material in addition to the episode reruns. So some of what I missed out on by only getting into the show this year is now available to me. One of those sometimes is the docudrama An Adventure in Space and Time, which covers the story of how Doctor Who began. Certain parts of this story I already knew--but not everything. And even for me, there was much of nostalgia in this movie. When I watched it, I had watched the classic episodes up to "The Web Planet," so I recognized the clips and sets that they showed because most of them were up to this episode. And the way that they introduced the Daleks, with suspense and comments about their silliness, all leading up to their ultimate success as foes. I heard about Daleks years before I ever heard of Doctor Who--that's saying something. But besides all the excitement at seeing this show begin and seeing reminders of its early days and its greatest successes, as a movie this story offered something rather unique--and just like the show itself. It's tragic the way that William Hartnell is so successful as the Doctor and yet simply cannot, physically, handle the role anymore. It's heartbreaking when he has to leave. But then his words "I don't want to go" echo the Tenth Doctor, and as he is filming his final scene, he sees the Eleventh Doctor on the other side of the TADIS. And we're reminded of the cyclical nature of the show and of everything. Sadness must precede a new dawn, and every person's role, however important, must end and a new person's role begin. It's the story of Doctor Who and it's the story of life. The story of Verity Lambert was inspiring and the story of a show's success was sweet, but best of all in An Adventure in Space and Time was the sense of a moment in time setting the stage for and overlapping over every future moment in time. There is joy, there is tragedy, there is hope, and there is life. I really enjoyed this movie. At about nine inches, this 75 gram bar stretches across a whole page of paper. 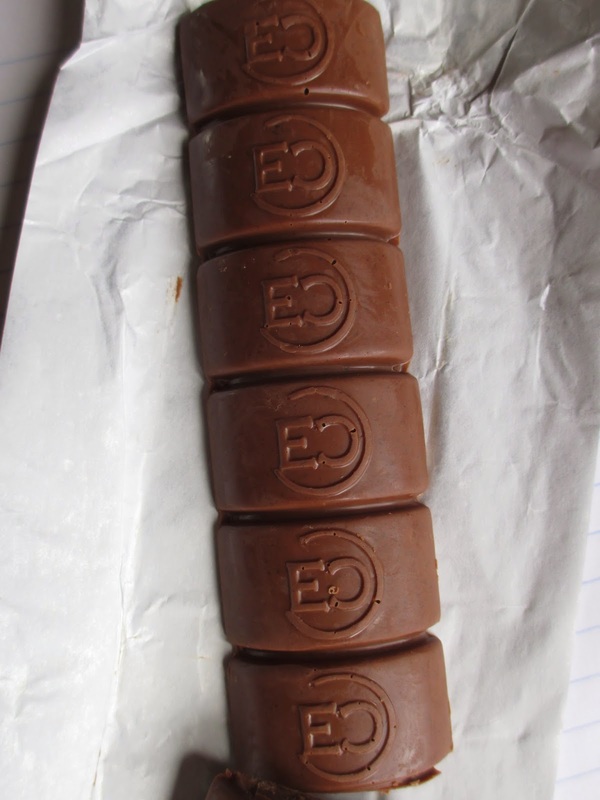 You don't usually see such long bars of chocolate; I'm not sure whether or not I like the shape. It does, however, remind me of the candy bar Charlie bought in Willy Wonka and the Chocolate Factory--which makes me further glad that I picked out a sweet chocolate. I suppose the size makes it stand out and makes it recognizable. It somehow also looks both masculine and feminine at the same time; it's bold because it's different, and yet it's sort of delicate because it can break more easily than a flat bar. The bar is divided into nine chunks. They're tastefully shaped so that the curve of the chocolate echoes the curve in the Eclipse logo. But while the large size of each piece seems to fit milk chocolate, I can't find myself liking this size for a more serious dark chocolate. Maybe that's the idea: maybe Eclipse Chocolate doesn't want to be overly serious. This chocolate smells wonderful. The description calls it "milk chocolate flecked with muscovado sugar, cinnamon bread crumbs, and sea salt." That description has promise in it. Cinnamon is wonderful in chocolate, a rich-tasting sugar sounds good, and sea salt is the popular addition these days. The aroma is intense cinnamon, like from fresh churros. It's very sweet, like the sweetness of a thousand desserts. When you bite in, the tendency is naturally going to be to keep on chewing: all those tiny bits of toasty bread have to be crunched. As you crunch, you come across the sea salt here and there and it helps to take off some of the edge of the sweetness. So you're crunching through bread crumbs, melting through chocolate, and sucking on salt all at once. 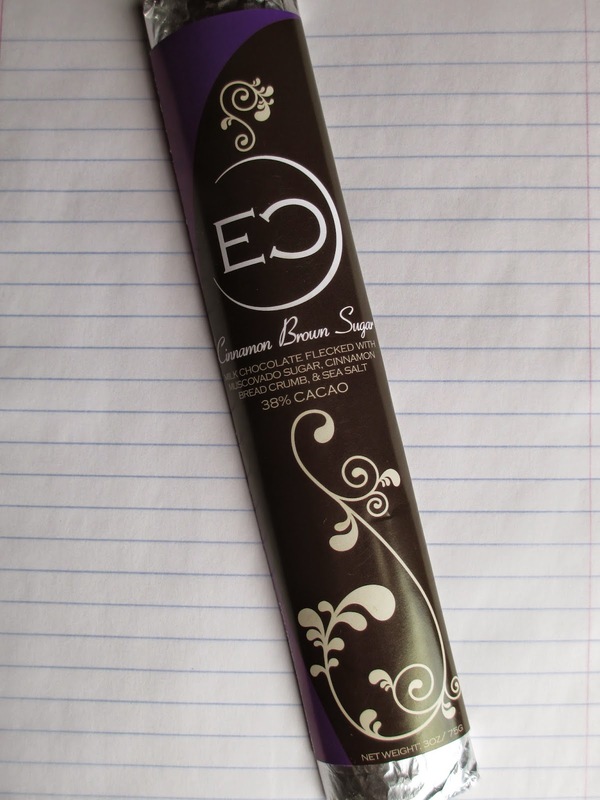 Although 38% cacao isn't the lowest percentage as far as milk chocolate goes, this one ends up feeling rather on the lighter end of things, probably because of how many flavors it has to compete with. 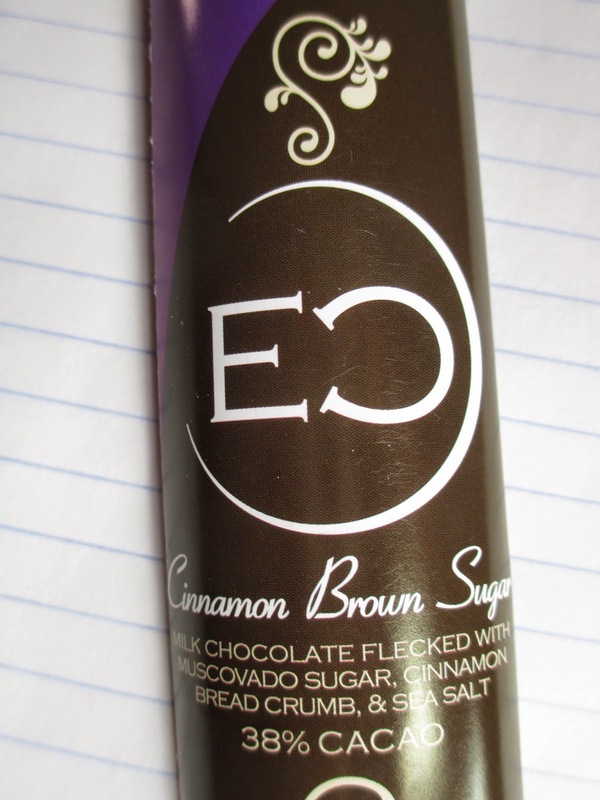 And on top of the sugar that was already in the chocolate, Eclipse added the muscovado sugar, so this is quite a sweet chocolate bar. Yet I think I would still call it a gourmet candy bar. It satisfies the sweet tooth, that's for sure, but sometimes we need things to satisfy our sweet tooth. And why reach for a Milky Way that's going to disappoint you with its cardboardness halfway through when you can have a sweet bar that still has some thought behind it? Sure, it's a tad on the greasy side, but the overall combination of ingredients and flavors is quite nice. The milk chocolate, the cinnamon, and the sugar are the familiar and safe ingredients. The salt adds a contemporary, more adult edge to it. And the bread (which I have only had in one other bar, from Theo) adds something silly that also makes a lot of sense. Just picture a piece of toast with sugar on top, a cup of hot chocolate with cinnamon, and a little salt to lick off of the palm of your hand. The Cinnamon Brown Sugar takes all of that and melds it into one seamless chocolate. Click to view my thoughts on: Book 1, Book 2, Book 3, and Smaug. 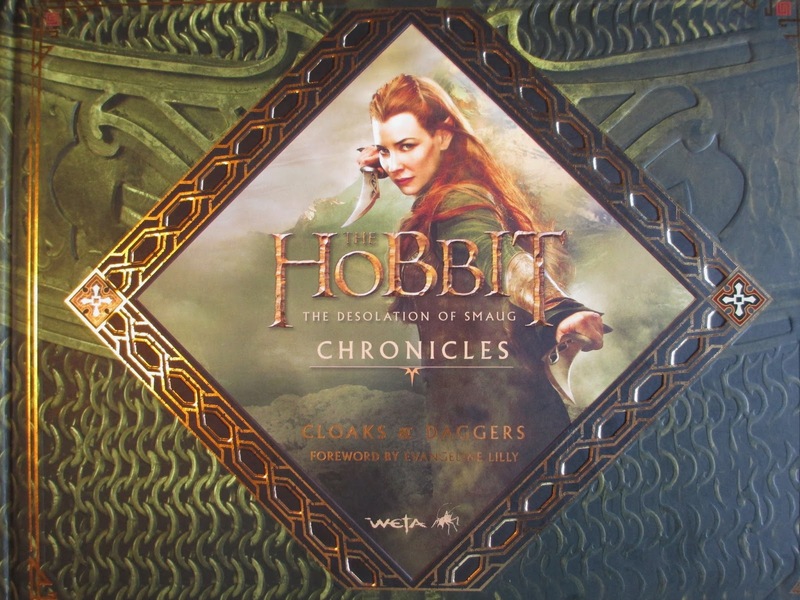 The fourth book in Weta's series, The Hobbit: The Desolation of Smaug, Chronicles: Cloaks & Daggers, is also the heftiest. It comes in at about 250 pages, and what with the same longer size as the rest of the series, it's one heavy book. No, not the heaviest movie book in my collection, but still enough to be intimidating. I mean, much as I love to hear about moviemaking, there can come a point when you're overwhelmed. Yet I still enjoyed this book so much--I said before that Book 3 may have been my favorite, and now I want to give that title to this one. Like Book 3, Book 4 gives some focus to some of my favorite places, Lake-town and Beorn's home. But it also has an interesting approach to content. The subtitle is "Cloaks & Daggers," so there is quite a bit of attention to fabrics, materials, and building (which can mean building chairs, armor, clothing, and everything else). This book is all about the costumes, armor, props, and sets. Everything is in so much detail and all the crew express their ideas so well that I found myself getting lost in it all (in a good way). While everything they say and everything they did with their work was formed to help tell the story, their work has become a story in and of itself. The fascinating endeavors of this talented group of people had me very enthralled. That is, I was enthralled at my own pace since I did take some weeks to get through this book; it's just that there is so much in it to absorb. 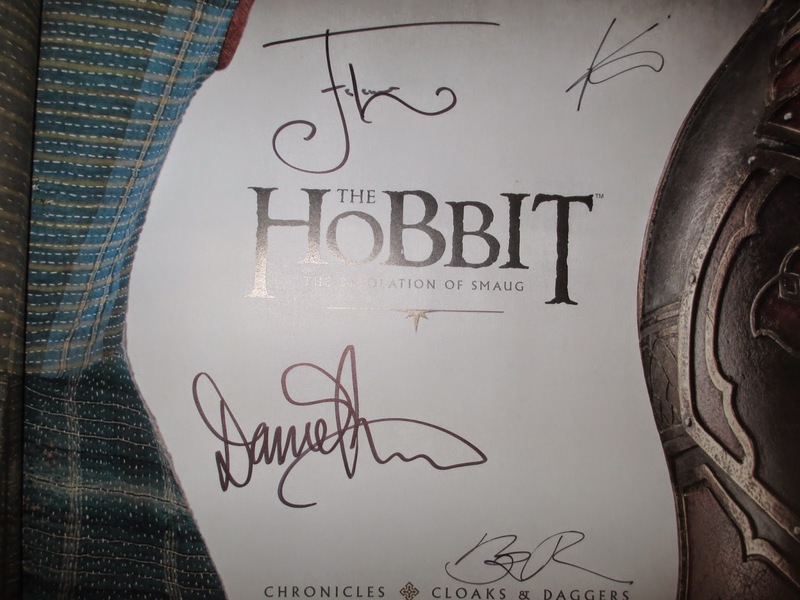 My pre-ordered copy was signed by Daniel Falconer, Kevin Smith, Daniel Reeve, and Ben Price. Format-wise, there were helpful captions to the imagery this time. And the images were just as thorough as usual, with costumes and props and close-ups. All enough to keep you staring at one page for a long time. I didn't know I loved the weapons of Dale so much: I'm not usually as into the weapons (sorry), but those, those were gorgeous. Four books in, plus the Smaug book, and I'm feeling like I've had a window to peer in at a filmmaking family. Even if I didn't like how the movies turned out (which, as a whole, is certainly not true), I could still enjoy these books. They're everything. That's it, I'm moving: there just aren't any chocolate shops where I live. Not only are there none in the area, but in the whole state (sort of). It's terrible. But I know, the lack of chocolate shops is just one of the prices I have to pay to live where it is beautiful. I know. And it's probably for the best, anyway: this way, chocolate remains special because it is more scarce. So any time that I go out of state, I try and look up chocolate shops around where I'll be. I usually try and visit at least one of them. So my "at least one" shop for the San Diego area was Eclipse Chocolate. I thought perhaps breakfast there would be nice since they also serve food, but that never happened. In addition to food, chocolate, desserts, hot chocolate, and tea, they also serve alcohol, so there is quite a variety of what they have on offer. It's nice to have options. When I looked up the place, I saw that it was near Balboa Park, which is where the museums are. I thought, oh, good, it's near the fancy area. Well, the particular corner where the cafe is isn't particularly fancy--but the shop is nicely designed and very clean. With blue and white, it's made up to be a hip hangout spot. Since I went there after lunch, all I ordered was a drinking chocolate. And since it was after lunch, I went for a lighter milk chocolate versus something heavy and dark. The Cardamom Rose Milk Chocolate (with soy) was my choice. The good-sized white mug came with two fresh marshmallows. I pinched a taste because they were so pretty, but didn't eat them because I'm one of the people who don't really like marshmallows. The chocolate was good, and I was glad that I didn't order something dark because if it's dark, I prefer a much smaller serving. The rose gave it that soft, floral feeling, while the cardamom added a touch more spice and movement to keep it all from becoming cloying. All very pleasant for an afternoon drink. On the way out, I picked up two truffles and one chocolate bar. The bar I will save for a later post, but the truffles I will address now. The first was a champagne truffle, which I chose since it's a kind of must-have flavor. There may have been something more to the name, but I don't remember what it was. There is a dried cranberry on top, which I'm not sure I get, but the chocolate smells fragrant and the ganache looks smooth when you cut it open. The mouthfeel is also smooth without being plasticy; the flavor is rich and light at the same time. There are rich cocoa notes, possibly a hint of salt from the other truffle, and a berry-like flavor for a splash of color. It's a nice truffle, maybe not the best I've ever had but of course a thousand times better than mass-produced chocolates. The second truffle was the Lavender Sea Salt Caramel, which is a rectangular chocolate with sprinkled salt and lavender. I think it was available in milk and dark; I didn't specify which one I wanted, so I ended up with milk, which I think goes better with the caramel, anyway. As you can see, the caramel is semi-stiff, so it doesn't flow out on its own. While the lack of messiness is nice, I would have preferred a less chewy caramel: chewiness always feels less fancy to me. It does, however, taste nicely of vanilla and sugar and whatever else caramel is composed of. I'm starting to get tired of hearing of salted caramels because everyone does them, but the addition of lavender in this truffle makes it more unique and entertaining. Lavender does, after all, have a zing to it that is not entirely unlike the zing of salt. Now, the salt is still more prominent than the lavender (and it's delicious, flaky salt, by the way), but the lavender still adds some of its floral, citrus pop. I like this subtle addition to a popular chocolate flavor. Now that Eclipse Chocolate has passed the taste test, I can go on to praise their other aims. They work with Guittard Chocolate (which has long been one of my favorites) for ethically-source chocolate, they use organic ingredients when they can, they don't add vegetable fats to the chocolate, they produce their chocolates in small batches (as you can already tell), and they donate a portion of profits to charities. So, yes, Eclipse Chocolate has a lot going for them, and I am a bit jealous that California has places like this and Arizona, basically, does not. That title sounds funny if you're not thinking of Doctor Who, doesn't it? But ever since I started watching, the phrase "the doctor" only reminds me of one character. Of course, the gifts I refer to come not specifically from the Doctor, but almost. The Hillywood Show has been shipping out the gift packages that went with donations to their Doctor Who Parody fund. Mine arrived this week. What's more exciting is that these gifts come right before Season 8 of Doctor Who begins airing next week. This is the first time I'll be watching the episodes as they come out. I'm so very glad that they air on the same day in the U.S. as in the U.K.
No, that is not a fancy title I made up for my rambling about chocolate discoveries. It is the name of a dessert I had while I was on vacation. At the Omni La Costa Resort & Spa in Carlsbad, California, there is a restaurant called BlueFire Grill. And when I went to this restaurant, I ordered a dessert called The Exploration of Chocolate. Pastry chef Jaimie Hileman oversees all of the desserts and baking at the resort. I thought that I would just peek at the dessert menu, but I ended up wanting to try everything on it. It all sounded like it had thought behind it, as much thought as went into the food. For me, a bad dessert can easily break my opinion of a restaurant--and it can be quite hard to find good dessert. I was at first hesitant to choose the Exploration, despite the assumed great chocolate influence. My hesitation was based on one of three listed elements: white chocolate orange cake (unless it was lemon and I'm just remembering it as orange? I'm sure it was orange). I don't much like lemon or orange, even if they're combined with chocolate. But I was surprised to enjoy even this element of the mix. Having brought with me only a small purse, I didn't see the need for my camera, so you'll have to make do with a hastily-snapped phone picture. The small squares of cake on the left and right are the orange cake. The snake in the middle is chocolate gianduja (basically creamy chocolate with hazelnut, if you're unfamiliar). The round spot on the top is a chocolate ice cream-like item; the white spot on the bottom is mint ice cream. The tiny circle over to the right above the spoons was vanilla. A couple of dots of raspberry, two pieces of wafer-like cookie, and two sprigs of mint complete it all. What this means is that there is a lot to look at and taste, but the plate isn't filled with a mound of sweets that can't be finished. This dessert is shareable, but doesn't have to be. I shared about half of the orange cake and some small tastes of the ice cream. Now let me move on to describe why I was utterly enthralled by this dessert. You know I enjoy hazelnut and chocolate together, so the gianduja (and its large size in comparison to some of the other elements) was a big win from the start. It's creamy and light, with the right cocoa and hazelnut flavors. The white chocolate orange cake even was pleasant. Soft cake in small, bite-size pieces isn't overwhelming, and the orange flavor added an almost floral kind of mellow sweetness to everything. The mint ice cream acted like a palette cleanser for whenever you needed to move between elements or just get a fresh, clear taste into your mouth. But that chocolate ice cream. I forget what the menu called it exactly, but ice cream doesn't describe it; I just don't know what other word to use. It was cold, but it was also dense and very, very soft. With a chocolate flavor neither sweet nor rich nor boring, it was hopelessly elegant. And that dot of vanilla? I don't know what that was, either: it was like a drop of pure vanilla flavor, such a wonderful companion to the other elements on the plate. Was I happy? Oh, yes. I would go so far as to call this one of the best desserts I've ever had. Admittedly, I don't often get to go to restaurants where they would have amazing desserts, but that fact doesn't diminish the worthiness of this one. It was also the perfect thing for after dinner. Sometimes, even a good dessert is difficult to finish or enjoy right after you've eaten. But this one was the right size to not be overwhelming. And while all of the flavors were entrancing, none of them were overly rich or overly sweet. It was all in perfect balance. So I was on vacation. I'm back now; hello, world. And one of the things I came back to was the long-awaited, newest video from Keychain Productions. This is the first episode of the web series Wireless, in which previous Primeval actors Andrew Lee Potts and Lucy Brown are reunited. I do love reminders of Primeval. Written by Alex Moss and directed by Andrew Lee Potts, Wireless has that signature style we've become familiar with from Keychain, along with something more. I can't approach a Keychain film without addressing color. From the calm yellow at the start, the green in the opening scene, and the blue in the car to the pops of red, it is all very intriguing. Given that, plot-wise, this pilot episode seems to just be setting the scene, I'm looking to the colors for foreshadowing. In the night vision scenes, the red looks ominous and dangerous--but by the time we enter the car, it looks more glowing, like beating hearts. The red glows on the car seat headrests, as if standing in for the computer voice and the two people who have access to the car's camera feed. It's like we aren't just watching one person in the car: we're watching all four. Appreciation must also go to the cinematography here. Most of the ten minute episode takes place in the car, and in the front of the car, at that. Yet the camera moves around enough and with enough thought that I didn't get bored and always felt like there was something new to consider. This, in turn, brings us to the dialogue. All that hilarious, wonderful dialogue. I had thought that what I enjoyed most about Keychain films was their exploration of emotion through a thoughtful lens of color, but so far Wireless takes that thoughtful exploration and combines it with all the comedy of a Keychain vlog. I'm curious about the plot, but I also simply enjoyed sitting with the fun of the scene. We'll all be excitedly awaiting new episodes. Thank you, Keychain team, for the new videos. And for everyone reading, this is a fan-funded series, so please donate if you can: keychainproductions.co.uk. You know how it is, when you decide to go outside and sunbathe for just a few minutes, you turn on some music, and then three songs in your iPhone stops playing and says to please let it cool down before trying to use it. Oops. If the iPhone's too hot, maybe it's too hot for me, too? Nah, I'll stay out a few more minutes, anyway. And I did. Then I thought I'd do something more typically summery than sitting out in the too-hot weather. Ice cream is summery, right? 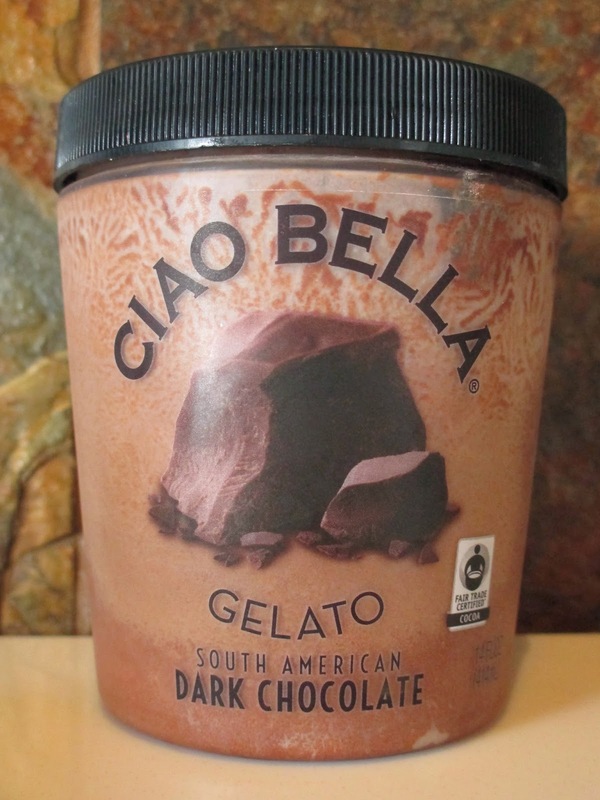 Time to bring out that container of Ciao Bella Dark Chocolate Gelato again. The problem is, I don't like ice cream that much. I'll enjoy a little if I'm eating it, but I don't crave it and I don't eat it by the bucket. Then again, I tend to buy the smaller, more expensive ice creams, and it's the big tubs of cheap stuff that have that addicting quality like fast food, isn't it? However the case, I opened this little Dark Chocolate container before and had some, then left it in the freezer without taking any pictures--or without finishing the gelato before it started to crystallize. As you can tell by the picture I finally took. So in my weirdness, I have mixed commentary to give. One, I appreciate that Ciao Bella used Fair Trade cocoa in this gelato; they also use organic cane sugar. As far as you can tell from an ingredients list, the ingredients look pretty pure. That's always good to know. If you look at the little "story" on the back, you will also find that the chocolate used (both chocolate and cocoa powder are added) is from TCHO. That's how Ciao Bella can get fair trade and organic chocolate for their gelato: they get it from a chocolatier. I've seen TCHO around, but haven't tried a huge amount of their chocolate; mainly I think I've dismissed it as probably good quality but not particularly interesting to me personally. Now we come to the reason why I think this gelato is good but don't like it that much. It tastes like dark chocolate. When it melts, the melting of cold gelato into room temperature mimics the melting of room temperature chocolate to body temperature. It's a great analogy of a melting mouthful of chocolate--except that the temperature is off and I can't get over that fact. I like the temperature of chocolate, not the coldness of the gelato. When I eat ice cream, usually what I enjoy best is a good quality, plain, vanilla ice cream; to me, that's the flavor that goes best with the temperature and texture. So this gelato is not for me. But if you are looking for a dark chocolate gelato that tastes of real chocolate and has real ingredients, here it is.